Rowan Tree is an extraordinary specialist school for primary school children with severe and complex, individual needs. 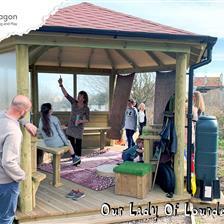 We feel privileged to have completed a huge transformation of the outdoor areas at such a superior school. 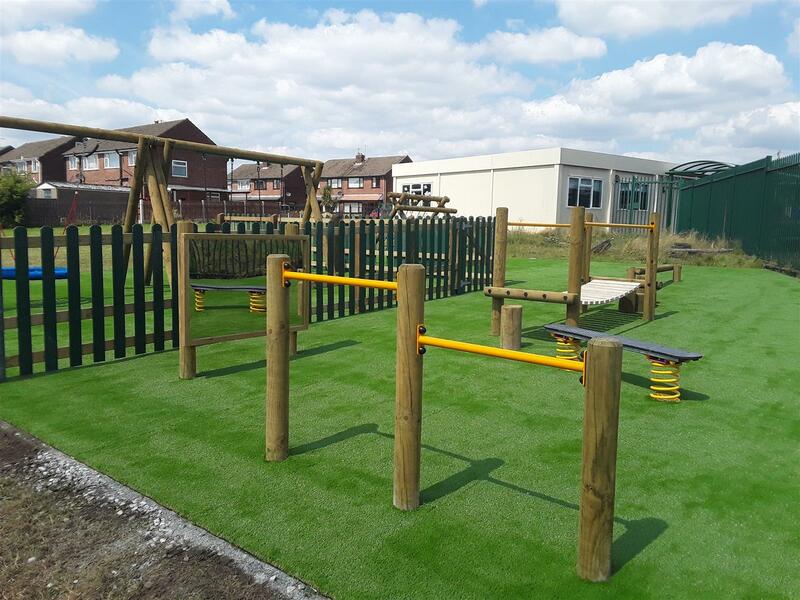 Our founder and owner, Andy Snell, worked closely with Rowan Tree Primary School to design and create a playground with distinct play zones, suitable to the specific needs of the children. This project brought up intricate logistical matters as most of the work was completed during term time to cause minimum disruption to children’s routines, taking into account the children’s complex needs. Our dedicated operations department had great communication with Rowan Tree’s business manager, Richard, and head teacher, Liz, to ensure their goals were met to a high standard and the work was completed in a time efficient manner. Prior to installation, we removed a variety of tired looking equipment and old fencing. We then laid down 334 m2 of black, rubber Wetpour Surfacing at 15mm-30mm depth where required. The surfacing is particularly important as it created an impact-absorbing base to protect the children from injuries. 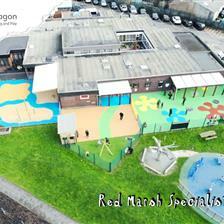 It is also an all-weather surface, so the children can enjoy playing outdoors, come rain or shine! 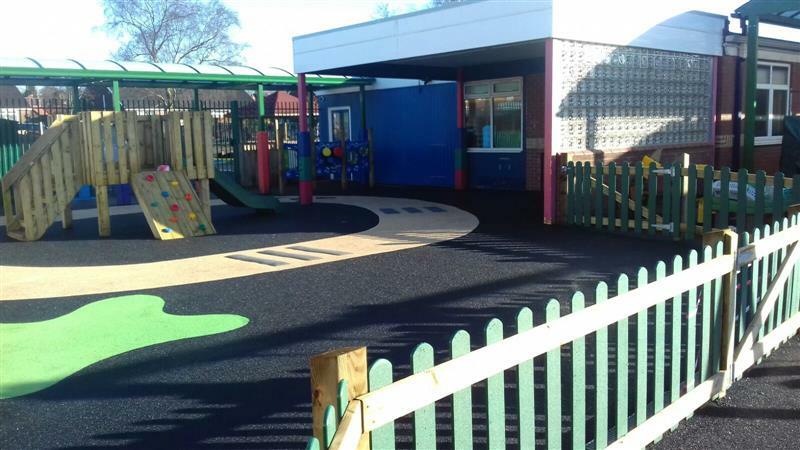 We used subtle, dark green HDPE Bow-Top Playground Fencing to zone off the investigative and Messy Play Areas. This delivered a segregated zone for children to stimulate their senses. This part of the playground includes a range of equipment, all specifically designed to encourage children to get messy with purpose and integrate information experienced through their senses, to understand the world around them. Laid adjacent to the investigative and messy play zone, we created another separated area to motivate children to get in touch with their artistic sides. We personalised and tailormade a large sensory panel made from wood, artificial grass and stones to familiarise children with natural textures and to stimulate their senses. In addition to the above, we added a range of Imaginative Play Equipment so that children can use their imaginations to inspire their play. It is a zone for children to explore their creativity: to spend time drawing, making music using the Outdoor Musical Instruments, or creating fantasy dens. 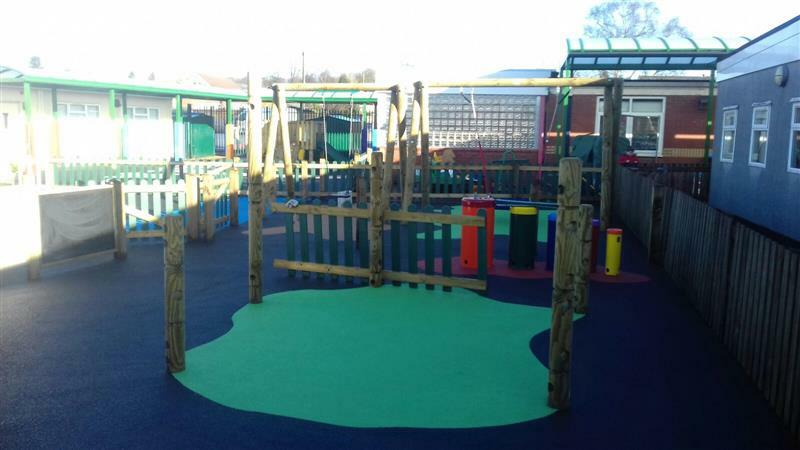 We used green and sandy-beige coloured splashes in wetpour beneath the swings to subtly invite the children to the area, whilst taking into consideration not to overstimulate and overwhelm children with sensory issues (with vibrant and bright colours). We created a secondary physical development zone for children, which took form as a fenced area on the field. It blends in well with the neighbouring grass as the Deluxe Artificial Grass closely resembles the look and feel of natural grass. To ensure it is a safe zone for children to use all-year-round, we added shock pad tiles beneath the playturf because of their impact-absorbing qualities, and to reduce the overall critical fall height. 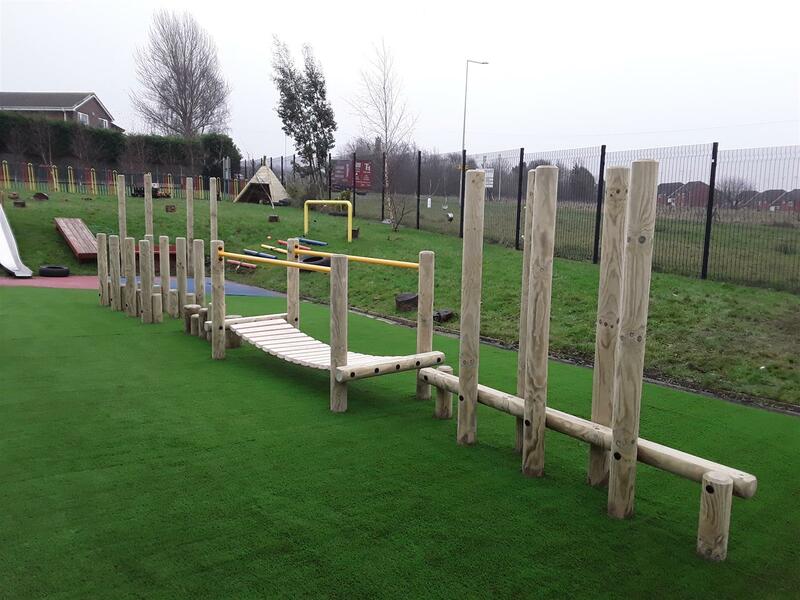 This superb zone includes equipment all designed and made from high quality playgrade timber and created to improve and develop the gross motor skills, muscle strength, balance and hand-eye co-ordination in children. It is an inclusive zone, with apparatus for children at all levels to enjoy. The modular Play Tower can be found surrounded by a wetpour roadway design in an earthy-beige colour with 9 brown and 5 grey stepping stones and 3 grey speed bumps. As it is a neutral colour, it can be whatever the children’s imagination dictates, whether they use the roadway as it is, or create a make-belief river, it is a great addition to the playground. Central to the roadway, the modular play tower offers children, particularly with autism, structure. As it is prescriptive, children know exactly what to expect and know the routine. It can be a lookout castle or used to create an imaginary, cool ship. A Daily Mile Track was added to the edge of the existing concrete playground, with multi-coloured Thermoplastic Playground Marking footprints for every 1.4 m on the track, to motivate children to continue to move. Whether they complete the full mile or work in stages to build their physical fitness, it can help children to walk, run, hop or skip and generally be active. We installed a 13m x 3m, freestanding, Timber Canopy, which was designed to meet building regulations approval. 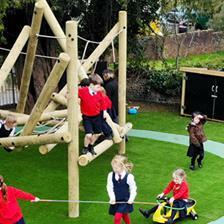 It is structurally graded and made from playgrade timber to make it safe for children to use. For the surfacing, we used deluxe artificial grass, so that children can enjoy outdoors in all-weathers, whilst being protected from rain. This is a very special project for us and we have thoroughly enjoyed every moment of working on it, from design to implementation. 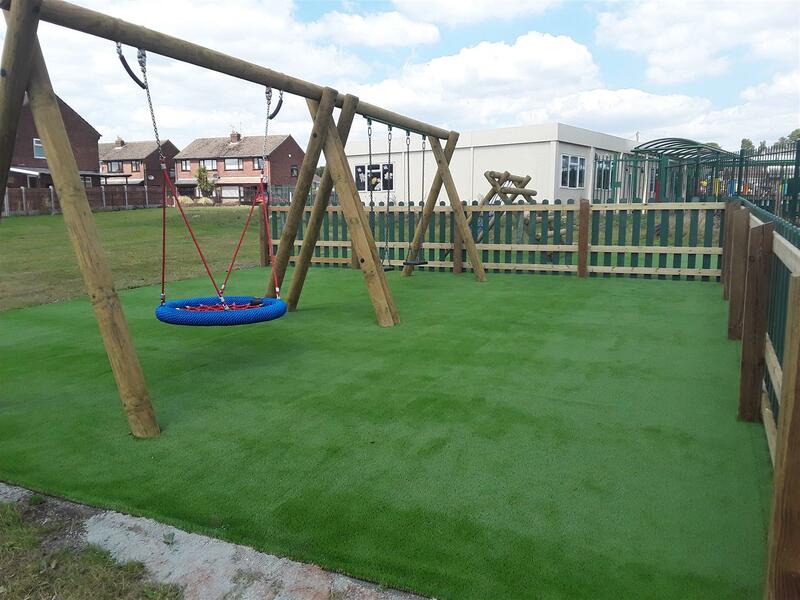 We wanted to ensure that the outdoor areas were made and completed to perfection so that Rowan Tree Primary School can continue to do the fantastic work with their extraordinary pupils. If you are looking to create a fully inclusive and stimulating playground environment for children with special educational needs, Contact Us to speak with one of our SEN experts. You can also view our amazing range of products for children with Special educational needs here.